The Studio 192 as an audio interface handles up to 26 inputs, eight of which are class A remote-controlled XMAX mic preamps, all performing at a pristine 192kHz audio resolution. Ultra-low latency USB 3.0 connectivity, eight balanced TRS outputs, balanced stereo Main outputs, two headphone amplifiers, an onboard Talkback mic, and advanced monitoring features make the Studio 192 an exciting and attractive interface, but that' not all it can do. 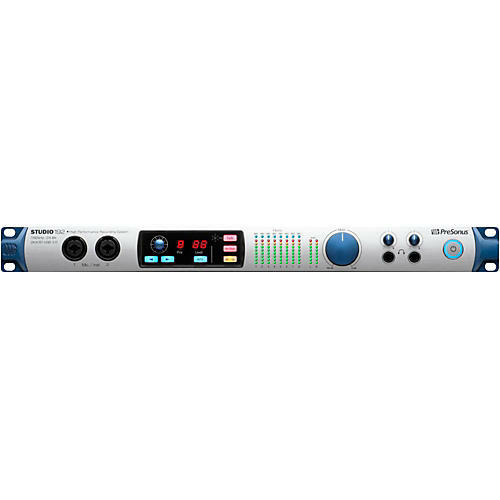 The Studio 192 is your single-space rackmount audio interface and studio command center. Tight integration with the included Studio One digital audio workstation provides remote control over every Studio 192 microphone preamp plus onboard zero-latency monitor mixing control right from your recording environment. Studio One' exclusive hybrid Fat Channel plug-in can run on your computer' processor and switch to the onboard DSP on your Studio 192 with a sonically seamless transition. Now you can monitor with award-winning StudioLive EQ and dynamics while switching between playback and recording with no audible change. Zero-latency monitoring with effects is also available from UC Surface for third-party DAW users. More than just abundant I/O, Studio 192 is designed to be the central hub for any project or professional studio. The onboard Talkback mic can be routed to any mix. The outputs can be used for monitor mixing or for speaker switching. Onboard Dim and Mono options let you take control of your Main mix. Studio 192' two headphone amps each have a dedicated stereo output and can listen in on any mix, ”perfect for in-studio collaboration.